With Windows 10 version 1903 just a month or so away, it is quite puzzling that a large number of devices have not yet received the update to Windows 10 version 1809. Microsoft began the rollout phase of Windows 10 version 1809 on January 16, 2019 but restricted automatic updates via Windows Updates. Only devices that the company believed to have the "best update experience" would receive the update back then. Administrators could run a manual check for updates and would receive the feature update then if no upgrade block was in place and if the device passed compatibility tests. Microsoft lists one upgrade block currently on the official update history page of Windows 10 version 1809. Devices who run "certain new Intel display drivers" are blocked from receiving the update via Windows Update. The solution right now is to update Intel display drivers so that they are newer than 24.20.100.6345. 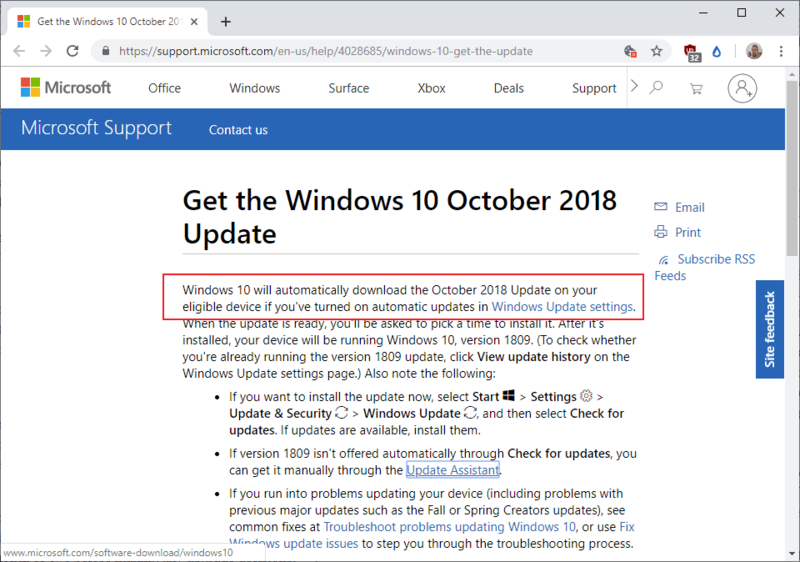 Microsoft updated the "Get the Windows 10 October 2018 Update" support page yesterday to indicate that the rollout of the new feature update for Windows has finally started. Windows 10 devices will receive the feature update automatically now provided that they are compatible with the new version and don't meet any upgrade block that may still be in place; this is true for devices with Windows Updates set to download and install updates automatically. Microsoft suggests that administrators run manual check for updates if the update is not offered automatically at this point. This is done by going to Settings > Update & Security > Windows Update, and activating the "check for updates" option on the page. It is still possible that the feature update is not returned when administrators run manual check for updates. Administrators may then download the Update Assistant from this Microsoft page to use it to update (or receive information on why an update is not possible). One has to wonder if it would not be better to sit this one out and wait for the release of the upcoming feature update. While it is certainly an option to upgrade to Windows 10 version 1809 and then a month or so later to Windows 10 version 1903, it is probably less time consuming to skip 1809 and wait for 1903 instead. Now You: Do you run Windows 10? Are your devices already on version 1809? If you have bitlocker turned on, hope you have the key! Got 2 co-worked bricked because Dell installed OS and we don’t have the key. Sitting it out may seem like a good approach. But, this doesn’t tell you why you are not getting the update. Maybe you won’t get the next ones either. One of my PCs got the update over 1 month ago. The other one did not. So, earlier this month I dug into the advanced update options. I found that the PC which got the update was set to Semi Annual Channel (targeted) and the PC which did not get the update was set to Semi Annual Channel. I changed that and, the next day, it updated. For those who are wondering, check that setting to see if it’s the culprit. I have 10 Pro 1803. The machine was custom built in Sept. 2013. Intel MOBO. 8 GB. I-5 3.2 GHz. While the machine isn’t new it certainly should pass whatever test M$ has in this regard. “Automatically download updates…” is Off (but I keep getting updates for 1803, Adobe stuff, whatever else). Both “defer”s are 0 days. Not that I’m complaining, but why no 1809 upgrade? Would 1903 come thru? I’m still on 1803 through no intervention of my own. I tried doing an 1809 offline update from a USB made with the media creation tool and it crippled edge and somehow seriously slowed down firefox. As I’ll most likely have to result to a ‘clean install’ I’ll wait as long as I can not because I’m not looking forward to any of the new features but because I simply want my PC to keep functioning. All running 1809 without any issue. Just two PCs with windowss 10 pro are not as I have a much more cautious approach for them. Hope the 1903 update will be less problematic anyway. I think Microsoft should move to a 1-update-a-year schedule. Still not approved for Semi Annual Channel . My two machines are set to “Semi Annual Channel”. Updates came through yesterday without a glitch. Can’t imagine people willing to suffer the Win 10 Sorry-Go-Rounds every 6 months. Still having issues such as random freezes and video stutter on 1809.Maybe the mass roll out will turn up some clues. Meanwhile, people are still reporting that 1809 trashed their computers or “made game performance worse”. Well, 1803 works now, at least the security updates do. Haven’t seen a feature update that interests me in the least since last October. I look for updates in the MS Update Catalog; Windows Update is disabled in GP. In fact Win 10 itself is kind of pointless; Win 7 and eventually 8.1 worked fine. Can’t imagine how many useless “features” will be turned off when and if 19XX is released. 1809 is another Win 8, best forgotten. Been running a clean install Windows 10 Pro 1809 (build 17763.253) in a dual boot with Windows 7 Pro since a few months. All crap uninstalled by BCUninstaller before I hooked it up to the web. Updated only by WuMgr. All functions well. Mind you, this a stand-alone rig. P.S. Checked my Intel display driver: version 20.19.15.508. Seems that a clean 1809-install isn’t bothered by the older version. i have Windows 10 v1709 running v23 series intel drivers, Im getting the update to v1809, but I have kept it on hold. Is it OK to download the update having v23 series Intel Drivers? “Straight from the horse’s mouth”. M$ has just admitted that new Win 10 Versions likely does not run on older devices/computers, probably 5 years and older, eg today’s Win 10 Version 1809. ……. Sometime after Jan 2020, the EOL for Win 7, M$ will probably stop auto-upgrading all Win 10 computers that are 5 years or older, eg not auto-upgraded to Win 10 Version 2003 = affected users will be forced to buy new PCs if they want to continue running Win 10 = Planned Obsolescence. How are hardware vendors supposed to keep up with all these updates, and how many other incompatibilities creep in besides Intel display driver issues? MS isn’t making their OS more stable and reliable, just the opposite. Don’t think skipping a version is possible, or it hasn’t ever worked for me in the past. The upgrade path is well-defined by MS, and one may find leaping from 1803 to 1903 a miserable mess. Anyway, rather than let MS roll out an expected upgrade at an unexpected time, I took Rufus and the new .iso script feature for a spin today and installed 1809 Pro on two machines without any problems other than the dreadfully awful “dark theme” overtaking windows. Would recommend a full image backup, however. Now I can wait for six months when 1903 may be ready. A serious wince–do I dare take a Windows 7 computer with Windows 10 Digital Entitlement to 1809? = a long list (for the past 1 year) of Win 10 computers being broken or borked by M$’s forced auto-updates.